Looking to share the Gospel simply and engagingly? Why Jesus? is Nicky Gumbel's Alpha Course mini-book that explains effectively and concisely who Jesus is, what he said and did, and why it matters to you today. 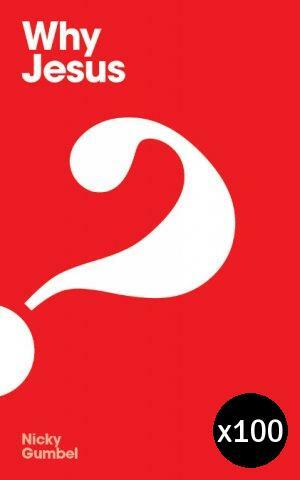 Designed as the essential booklet for Alpha course participants, this smart red pocket book is also a great resource for churches large and small, for outreach and mission, and for giving to friends who are asking questions about life, Jesus and what really matters. With this booklet to hand you'll be able to explain simply and concisely who Jesus is, why he came, why he died and how accepting him and his message is a world-changing moment in anyone's life. The pocket sized booklet is ideal for keeping a copy or two in your car, pocket or handbag so you're always prepared to answer that question, meet that need and seize that opportunity for Christ. Why Jesus? Pack of 100 by Nicky Gumbel was published by Eden bundles in November 2016 and is our 1410th best seller. The ISBN for Why Jesus? Pack of 100 is EDENBUNDLE-1796. Be the first to review Why Jesus? Pack of 100! Got a question? No problem! Just click here to ask us about Why Jesus? Pack of 100.